You are currently browsing the The Pet Product Guru blog archives for the day Saturday, November 7th, 2009. 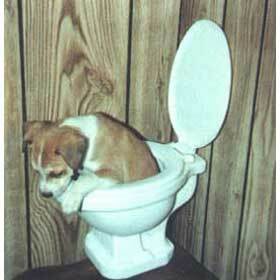 Chronic pet defecation difficulties – are you buying more pet odor removal products than usual? It’s not unusual for dogs to have occasional bouts with diarrhea or constipation that get better on there own. If your dog has ongoing episodes or it you see blood in his stool, consult your veterinarian right away! Michael Leed, a professor of small animal internal medicine at the Virginia, Maryland Regional College of Veterinary Medicine says that your pet can be suffering from irritable bowel syndrome. He also mentions that this can be quite serious requiring hospitalization and fluid therapy. Stress and bad eating habits can be associated with this syndrome but these aren’t the only causes. Your veterinarian will run a series of tests to determine exactly what’s wrong and come up with an appropriate treatment solution. In the meantime, if your dog is suddenly having “accidents,” never yell or punish him. Just keep using the pet odor remover and get him to the vet right away!